Breached contracts are a common and serious issue for both individuals and businesses. Commercial leases, licensing contracts, buy-sell agreements, loan agreements, and employment contracts are just a few of the types of contracts that, when violated, may entitle you to damages. Contractual disputes can take many forms, but the most important thing is to be represented by an attorney who can properly assess your contract and effectively protect your rights through targeted and efficient litigation. Although businessmen and women may do their best to make contracts as comprehensive as possible, disputes can still arise. Here are some of the common contract types, as well as the legal challenges they can create. In services contracts, one party contracts another to provide a service within a stated period of time. Typically, services contracts specify the responsibilities of the service provider as well as the payment schedule. Delays, quality issues, and nonpayment are common issues that can lead to disputes. As a plaintiff, you will often have to navigate complex legal and factual defenses to recover damages for your financial losses. Buy-sell agreements determine how a business and its resources are transferred when a new owner acquires a business. Because many of these situations involve parties selling businesses that they built or operated for many years, buy-sell contract disputes can be especially sensitive. Buy-sell contracts also become the focus of lawsuits when a business has multiple owners. There may be a disputes, for example, over how proceeds of a sale will be allocated, who controls a business, or other related issues. Formal employment contracts help employers and employees understand their responsibilities to each other. They also set expectations for compensation, services, conduct, and termination policies. Many cases involve a plaintiff who was terminated early, terminated for improper reasons, or is otherwise owed money under their employment contract. As is the case with other types of contract disputes, the main issue is that a plaintiff must demonstrate losses suffered as the result of a contract breach in order to recover damages. When you purchase a franchise from a large business, the contracts involved are especially extensive and may be standardized across all franchise locations. These types of contracts usually contain highly specific language about the buyer’s responsibilities and may have clauses absolving the greater company from liability. These contracts can be challenging to dispute because many times franchise agreements have onerous dispute resolution provisions and other provisions limiting liability. For this reason, it is important to have an attorney on your side to make sure that you have a fair chance to make your case and recover your losses. When someone breaches a contract, you may have the opportunity to recover losses you suffered as a result. Damages can take the form of financial compensation, and a judge may additionally require the party who caused the breach to fulfill the contract. The normal type of damages that a judge may grant is compensatory damages, which can include reliance damages, expectation damages, and other types of damages. Liquidated damages are also available in certain circumstance. Liquidated damages are amounts that the parties to a contract have specified will be the recoverable damages in the event that the contract is breached. Both individuals and businesses can file claims to resolve breached contracts. Whether you’re a business owner, service provider, commercial tenant, or an employee, you have the right to file a claim when another professional or business has broken your contract. In many industries, victims of fraud and misconduct have the option of filing a lawsuit and seeking a just resolution from a judge and jury. For many investors and securities industry employees, however, the available legal options are far more limited. For them, FINRA arbitration is mandatory. WHAT DOES IT TAKE TO PREVAIL AGAINST WALL STREET? The Utah Times’ recent coverage of arbitration between Barclays Capital and a former Barclays employee perfectly demonstrates why FINRA arbitration can be so challenging for individuals going up against massive securities firms. William Thomas Pair worked for Barclays Capital for several years, having been recruited from his previous position at UBS. To convince Pair to join Barclays, the firm offered him a $1 million forgivable loan, which would be paid off after several years of employment. At one point, Pair’s loan was renegotiated to pertain to Barclays Bank, a British company, which means it should not have been subject to mandatory FINRA arbitration. Several months before that 7-year mark, Barclays fired Pair and assigned his outstanding $600,000 loan balance back to U.S.-based Barclays Capital. Barclays then filed for FINRA arbitration against Pair, who chose to represent himself. Barclays, on the other hand, was represented by highly paid outside legal counsel. The arbitrators chose to throw out the former broker’s key witness for unclear reasons. Pair lost, and no sufficient explanation was given for why Barclays had passed the outstanding balance back from its British owner to the U.S. subsidiary. As a result, Pair was ordered to pay back not only the $600,000, but also $20,000 in unpaid interest and $360,000 for Barclays’ attorney fees. Pair’s story is, unfortunately, not an unusual outcome in FINRA arbitration. In fact, in 2013, securities customers were awarded some portion of their claimed damages in only 42% of arbitrations. The challenges involved in FINRA arbitration are complex and fairly institutionalized, but navigating them is possible. As an independent non-profit, FINRA exists to create and enforce securities regulations for the protection of investors and the overall health of the securities industry. The challenges for victims of securities industry misconduct center around two major concerns. First, when you pay for the brokerage services of a securities firm, in most cases you sign away your right to a trial. This is also the case for employees of banks and brokerages who wish to resolve legal disputes with their employers. Securities firms have powerful outside counsel at their beck and call, which means that standing up against them in arbitration—and prevailing— is a tall and often expensive order. As the Barclays case demonstrated, losing in arbitration can result in a former employee or investor being liable for the firm’s legal costs. Second, arbitration panels are often far from neutral. Though they are required to remain impartial, the reality is that arbitrators are paid based on how many arbitrations they handle, and if they become known for giving Claimants favorable awards, the banks and brokerages will not use them. There have been past instances demonstrating some arbitrators’ potential conflicts-of-interest. HOW ARE FINRA ARBITRATORS CHOSEN? Arbitrators are charged with the weighty responsibility of deciding whether those who file claims deserve an award. FINRA maintains a roster of over 6,000 arbitrators. In order to become certified, arbitrators must complete approximately 10 hours of coursework and an entrance exam. According to research conducted in 2009, the proportion of arbitrators affiliated with the financial services industry, in contrast to those who are not, is approximately 1 in 3. This is reasonable in the sense that those with a securities background have first-hand knowledge of the nuances of the industry. It is concerning in the sense that some arbitrators may have strong ties to powerful securities firms, which could potentially color their decisions. FINRA has reviewed this issue in response to concerns that it may cause bias, and has passed restrictions on who is eligible to serve as a public arbitrator. Still, the structure of the system as it stands may make individuals involved in FINRA arbitration feel that they are powerless against a biased system. 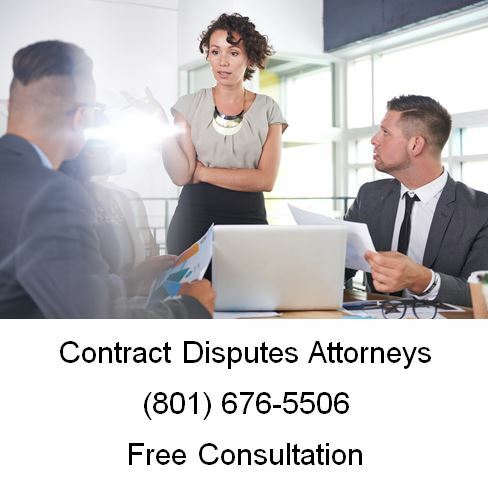 When you need a contract attorney in Utah, call Ascent Law for your free contract law consultation (801) 676-5506. We want to help you. Need a Construction Attorney in Utah?